On 1 May, George Syors Simyapen, Oktovianus Warnares, Yoseph Arwakon, Yohanes Boseren, Markus Sawias and Jantje Wamaer were arrested in Biak after police opened fire into a crowd of 50 people gathered for a flag-raising ceremony in commemoration of 1 May. Reports indicate that at least two people were hurt, including Jantje Wamaer who was shot in the knee. The six men reportedly face charges of treason under Article 106 of the Indonesian Criminal Code and possession of ammunitions and explosives under Aricles 1, 53, 55 and 56 of the Emergency Law 12/1951. Oktovianus Warnares was reportedly leading the flag-raising ceremony. 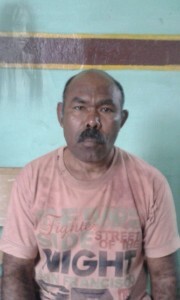 George Syors Simyapen, who initially received a prison sentence of 2.5 years’ from the Biak District Court, was later sentenced to 4.5 years’ imprisonment by the Biak High Court.